Media captionSierra Leone boy: "I've lost five members of my family"
Ban Ki-moon has launched another urgent appeal for funds to help fight Ebola after a United Nations drive for donations fell short of its target. The UN chief said a $1bn trust fund he launched in September has received just $100,000 (£62,000) so far. He joins a growing chorus of world leaders criticising the global effort to tackle the Ebola outbreak. The disease has killed about 4,500 people so far, mostly in Liberia, Guinea and Sierra Leone. Donors have given almost $400m (£250m) to other UN agencies and aid organisations directly but the UN trust fund, intended to act as a flexible spending reserve, has itself only received pledges of just $20m (£12m). Of those countries that have pledged money to the trust fund, only Colombia has paid, giving $100,000 (£62,000). The UN special envoy on Ebola, David Nabarro, said the fund was intended to offer "flexibility in responding to a crisis which every day brings new challenges". "It allows the areas of greatest need to be identified and funds to be directed accordingly," he added. Mr Ban said it was time for the countries "who really have capacity" to provide financial and other logistical support. Similar calls have been made in recent days by US President Barack Obama, UK PM David Cameron, and World Bank President Jim Yong Kim. Former UN Secretary General Kofi Annan has told the BBC he was "bitterly disappointed" with the international community's response. "If the crisis had hit some other region it probably would have been handled very differently," he said in an interview with BBC Newsnight. "In fact when you look at the evolution of the crisis, the international community really woke up when the disease got to America and Europe." The World Health Organization has said it is "ramping up" efforts to prevent Ebola spreading beyond the three countries most affected by the deadly virus. WHO official Isabelle Nuttall said 15 African countries are being prioritised for help in prevention and protection, with the four countries directly bordering the affected areas - Ivory Coast, Guinea Bissau, Mali and Senegal - getting the most attention. Meanwhile, President Obama has given the go-ahead for US military reservists to be deployed to West Africa if needed. They would join the 4,000 American troops already being sent to the region. The president also said he was open to appointing someone to head the Ebola response in the US, a so-called czar. Mr Obama's senior health advisors have met scathing criticism after two nurses became infected at a Texas hospital by a patient who later died. US officials now believe one of the nurses, Amber Vinson, may have been sick and contagious for four days and flown on two flights before being diagnosed with the disease. Disease control specialists are being sent to Ohio to help monitor people she came into contact when she flew there from Dallas last week. The cap forms part of a protective hood covering the head and neck. It offers medical workers an added layer of protection, ensuring that they cannot touch any part of their face whilst in the treatment centre. Goggles, or eye visors, are used to provide cover to the eyes, protecting them from splashes. The goggles are sprayed with an anti-fogging solution before being worn. On October 21, the US Centers for Disease Control and Prevention (CDC) announced stringent new guidelines for healthcare personnel who may be dealing with Ebola patients. In the new guidelines, health workers are advised to use a single use disposable full face shield as goggles may not provide complete skin coverage. Covers the mouth to protect from sprays of blood or body fluids from patients. When wearing a respirator, the medical worker must tear this outer mask to allow the respirator through. A respirator is worn to protect the wearer from a patient's coughs. According to guidelines from the medical charity Medecins Sans Frontieres (MSF), the respirator should be put on second, right after donning the overalls. A surgical scrub suit, durable hospital clothing that absorbs liquid and is easily cleaned, is worn as a baselayer underneath the overalls. It is normally tucked into rubber boots to ensure no skin is exposed. The overalls are placed on top of the scrubs. These suits are similar to hazardous material (hazmat) suits worn in toxic environments. The team member supervising the process should check that the equipment is not damaged. A minimum two sets of gloves are required, covering the suit cuff. When putting on the gloves, care must be taken to ensure that no skin is exposed and that they are worn in such a way that any fluid on the sleeve will run off the suit and glove. Medical workers must change gloves between patients, performing thorough hand hygiene before donning a new pair. Heavy duty gloves are used whenever workers need to handle infectious waste. A waterproof apron is placed on top of the overalls as a final layer of protective clothing. 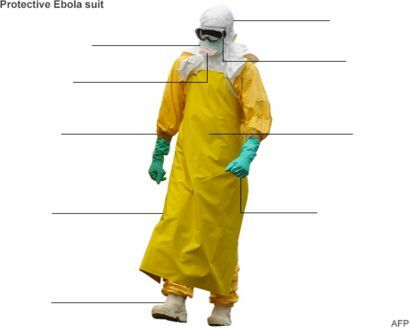 Ebola health workers typically wear rubber boots, with the scrubs tucked into the footwear. If boots are unavailable, workers must wear closed, puncture and fluid-resistant shoes.